Cluttered basement cleanout. Three words which easily strike fear and dread into your heart. It’s a daunting and thankless task. 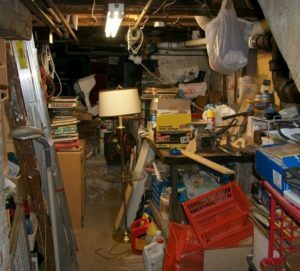 But, if you’re planning to finish the basement (or at least get it super organized), you’ll have to start with a total basement cleanout. This way, you can more easily reimagine the space and effectively plan for its best uses. With just a bit of elbow grease and some inspiration, you can have the basement of your dreams. Clear a wide pathway. The first thing you need to do is create a wide walkway so you can move things out freely, without tripping hazards and other obstacles. Let others know what you’re doing to avoid problems. Remove and separate items. Next, start to empty the basement, beginning with the area closest to the exit. Then, work your way incrementally toward the back so you create more space as you go. Organize all the items you are keeping. After you purge what you don’t need or do not use, then you can organize what’s staying to make it accessible in prioritized placement for easy retrieval. If you need a basement cleanout done right, please phone 800-433-1094 or visit Junk Garbage Removal.